With its historic location in downtown Akron, Crave is casual American fine dining infused with flavors of the world—Latin, Thai, Cajun, Italian, Hawaiian, and more. 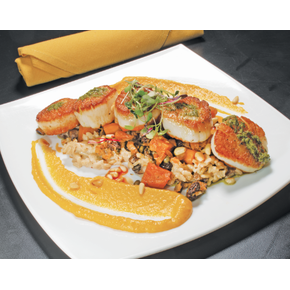 Crave is the heart of downtown Akron’s vibrant dining scene. The theme is “New American” with culinary influences from around the world—including Latin, Thai, Cajun, Italian, Hawaiian, and more. That’s what we love about Crave. You can be comfortable in blue jeans or a tuxedo. The restaurant’s exposed red-brick walls are a part of two historic buildings: a former 1890 Acme grocery store and the original home of the Akron Law School which later served as Jerry Springer’s local campaign headquarters when he sought the Democratic nomination for governor back in 1982. Crave’s current menu features a dozen appetizers like Buttermilk Fried Alligator Tail, Crab Cakes, Pierogies of Sweet Potato & Ricotta, and Executive Chef Jeff Kucko’s take on Paella. Salads oinclude Poached Pear, Kale & Beet, Baby Iceberg Wedge and CZR. For your entrée try the Red Breast Half Chicken or the Braised Short Rib with root vegetable mashed potatoes and a red wine demi-glace. A half dozen seafood options include the Red Snapper Linguine. Vegan guests will enjoy the Stuffed Poblano with sweet potato, corn, smoked tomato, vegan cheddar, chipotle sauce and black bean purée. The “So Forth” section of menu features lighter fare that is perfect for either lunch or an affordable, smaller-portion dinner with no sacrifice in quality. These items include Banh-Mi, the vegan Impossible Burger, Duck Confit, a Muffuletta sandwich, Pork Schnitzel, and a Blackened Haddock Po’ Boy with Cherry Pepper Lime Remoulade and Fried Crawfish. Every one of the more than a dozen offerings in this section of the menu is priced between $9.50 and $13.50. Crave’s wine list features over 100 different vintages and the 20-seat bar offers a rotating menu of more than a dozen specialty cocktails. There are plenty of dessert options, including a gingerbread cookie-stuffed French toast served with vanilla bean ice cream and espresso créme anglaise. Join the happy hour crowd from 4 to 7 p.m. Monday through Friday with $3 select craft beers, a dollar off all drinks, and three to four rotating flatbreads for just $6. Crave also features a party room for up to 40 people and a 16-seat outdoor patio during the season and there is plenty of parking. Crave is located in downtown Akron, but Aaron Hervey also owns two other restaurants—Crave Cantina is in Cuyahoga Falls offers Latin fare and globally inspired tacos, while Craft Cantinarecently opened in the Merriman Valley boasting build-your-own guac, tacos, burritos and bowls.